Cataracts cause symptoms including blurry vision near and/or far, sensitivity to glare, and an imperceptible but progressive loss of color vision as the lens turns yellow. Generally it is when either the clarity of vision is not good, or when glare sensitivity on bright days or at night that a person seeks help for the cataract. 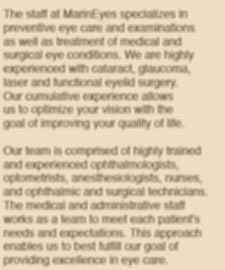 Whenever you have difficulty with your vision, from any cause, you should come in and let us evaluate the situation and diagnose the problem.